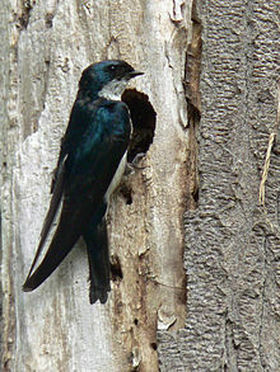 There are about 100 species of swallows and martins. Are found on every continent, except Antarctica. The sand martin digs a 120 cm long nesting burrow in riverbanks. The house martin often nests under the eaves of buildings, under bridges or other structures. Carry a mass of crushed insects - squashed into a ball in the throat - to take back to their young. Eat insects and catch them in the air as they fly. Drink by skimming the water at high speed.